Like many people, I associate patchouli with cool – particularly autumnal – weather. It has a warm, earthy, sometimes dirty aroma which goes well with bonfires and falling leaves. It can have hippy connotations but it can also be refined as exemplified by Chanel’s Coromandel. These days it’s usually cleaned up and paired with sweet fruit in the ubiquitous, youth -friendly “fruitcholi”. However a cologne-style take on patchouli is not something I’ve come across, until now. The mistral wind is a strong, cold, north-westerly that blows from the south of France into the Mediterranean. Can patchouli really take to the sky? Is it possible to transmute earth into air? Apparently so. Created by Jérôme Epinette and launched in 2013, the notes given for Mistral Patchouli are grapefruit, black pepper, star anise, iris, incense, geranium, fraction of patchouli from Indonesia, benzoin and vetiver. Some perfumes use coconut to give a beach-y feel as in Bronze Goddess, or are inspired by the ocean like Hermessence Epice Marine. However Mistral Patchouli is the smell of the shoreline, where land meets sea. The fragrance starts off with sunlight sparkling on the water’s surface. 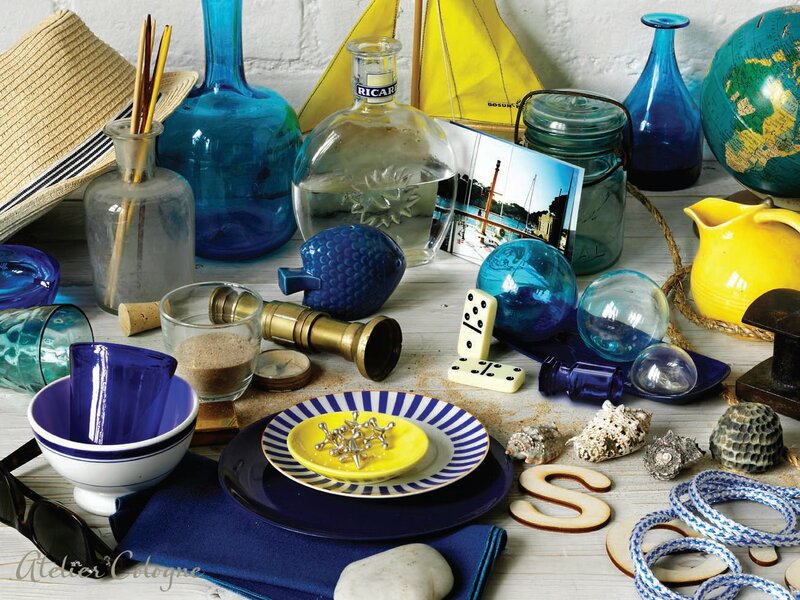 A zesty opening exuding ozone and setting the maritime scene. I have issues with grapefruit but it’s very fresh and pleasant, not at all sharp or reminiscent of body odour (thank goodness). On the flip-side, pepper has long been a favourite note of mine and here it’s sprinkled over the grapefruit flesh, mingled with just a hint of incense and star anise. Everyone except for you has left the beach for the day. The sea breeze is whipping up and the tide is out, leaving behind driftwood and seashells. You stand at the water’s edge with the grassy dunes behind you, an old weathered pier to your side and the sea stretching endlessly ahead. The bracing wind feels good against your over-heated skin. You shut your eyes and inhale that site-specific scent of damp sand, long grass, musty wood and briny air. You turn and head for home, carrying this coastal cocktail of aromas with you on your skin, after it’s been warmed by the sun and cooled by the wind. 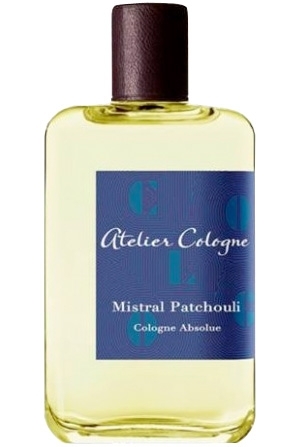 Mistral Patchouli could make a nice alternative to the classic citrus cologne. It’s subtly spicy and sensual whilst still being clean and lightweight. I can imagine it being worn with a white shirt to the office on days when you’d rather be roaming the shore. If you’re not generally a fan of full-on patchouli, don’t be too put off. It’s very airy and smooth. You don’t get much sillage but longevity is very good. Anyone could wear it but I find it more masculine than feminine in character. How do you feel about patchouli perfumes? What type do you prefer? This entry was posted in Atelier Cologne, By Tara, Fragrance Reviews and tagged Atelier Cologne, Fragrance, Patchouli, Perfume, Review. Bookmark the permalink. Every time I smell Coramandel I think of Val because she bought it the first day we met. I have since purchased it just for memories sake, and I love it. As far as Mistral Patchouli is concerned I am yet to try it but you make it sound fabulous. I know Val loves patchouli but didn’t realise she owns Coromandel. How lovely that you bought some yourself purely for the happy memory it brings back. Perfume is great like that. I really liked Mistral Patchouli for its unusual interpretation of patchouli but I never felt like I need to add it to my collection. I definitely love other Atelier Colognes more. I have trouble with patchouli too but I liked its treatment here because it’s so different. I remember that Sylvie said (and it was also mentioned in press materials I think) that they used a different menthod to produce the essence. I do like patchouli so I’m looking forward to trying this one. I sounds very different to any other patchouli fragrances. Are there others in the line worth investigating too? I think you could well like this one. Let me know how you get on. As for others in the line, the recent Cedrat Enivrant is a sparkling lemon cocktail. I’m not a fan of lemon-heavy perfumes but it was a big hit with everyone else. I like the tea-based Oolang Infini and B fell for Vetiver Fatal in a big way not long ago. Gold Leather is pretty full-on boozy, fruity and oudy. The whole line is pretty solid and well worth investigating, especially if you can find somewhere that stocks the 30ml bottles. Perfect description and imagery for MP, Tara, thank you! I love your review. That’s great, thanks shylotus! I’m very happy that my post chimed with your own experience of Mistral Patchouli. Thanks for taking me to the seaside, Tara – I really appreciated it as it is a good two hours drive from here! 🙂 normally associate patchouli with autumnal or winter scents as you say, but I am very intrigued at the thought of a marine interpretation – well, shoreline, rather. You do mention that it is slightly more masculine, but I would be curious to try it all the same. “Oh I do like to be beside the seaside”! I think it’s a clever twist. It’s nice to come across something a bit novel. I wear it happily and I’m not one for masculine-leaning scents. It only just tips the balance, really. Normally I like patchouli, and normally I like this line a lot. However, when I tried this it turned to anise instantly, and stayed there. I loathe anise. I was at my boyfriend’s house while testing, and it immediately brought on a migraine for him (he didn’t even put it on, he was just in the room with me when I tried it). Sadly, this was an instant scrubber. What an awful experience! Your poor boyfriend. I’m not keen on anise either but it doesn’t seem to bother me here, weirdly. If it was overwhelming on me I’d scrub too. Thanks for the review, Tara! I’m very behind in sampling this line but Mistral Patchouli is one I’m most interested in, being a patchouli lover of all sorts, especially the thick resin-y ones in the winter months but really, all sorts. This summer I’ve been wearing a lot of En Voyage Go Ask Alice which has a green patchouli note, rather herb-y in nature with a clean, refreshing feel, you might like it. Thanks for the tip about Go Ask Alice. I’m yet to find a patchouli perfume I’d want to buy a bottle of but I keep trying. I think maybe I just prefer it as a supporting note. I wonder if patchouli lovers might actually be disappointed in MP because it’s so light and clean but if you like all kinds of patchouli it still might appeal to you. Thanks, Asali. How nice to be able to live near the sea and smell it in the air. MP does have a great name and a good concept but it’s unlikely to be for you. I agree, Silver Iris is your best bet. When you come to London there will be so much to sniff! HI Sandra, there have been quite a few releases from AC recently. It’s always hard to keep up! This lovely store is on a quiet street on the right bank of Paris…we love all our friends at the Atelier Cologne Shop. If you purchase a bottle of perfume or cologne they gift you with a smaller bottle in hand-tooled leather with your own initials. Of course, in New York you can also visit the shop for the same great service. The 30ml bottles with the leather cover are great. MP is quite nice! Just dabbed a little on my hand and it brings to mind AG Mandragore or Mandragore Pourpre! I have not done a side by side test, though. Am I the only one 😉 ? That’s interesting. I hope someone who knows both will add their thoughts. A little of MP is nice. Not one I’d want to spray with abandon but then I’m not a patchouli person. Thanks for such a lovely review of one of my favourites (it even made it into the top 5 list I posted here a few weeks ago). I’ve enjoyed wearing it a lot this summer (I like the way the patchouli gets a little richer and deeper towards the evening) but I think it will work even better in autumn. I find it’s a good one for work; i’m not a flan of classic colognes or citrus perfumes, but this keeps me interested while remaining a touch austere. Alice, you describe its benefits so well in your in your last sentence. To put into your Top 5 is very high praise. I have no doubt you’ll enjoy wearing it in the autumn too. Aah, you two are too cute! Give this one a whirl next time. Hopefully you won’t get an anise overload. Being a patchouli fan I imagine it would be nice to have one in your collection that you can wear in the summer months. I tried MP in spring. I usually have some trouble with patchouli (I love, and own, Coromandel but that one shifts a lot depending on temerature and humidity, not always in a good way). MP was a lot about anise or fennel on my skin. I found Sous le toit de Paris even more interesting, so that is what I bought in June and have been wearing quite a lot. Plus I needed a New bottle of Orange Sanguine. Always hard having to pick only one or two scents when my wish list is long! Some people really seem to get a lot of anise from MP then, it seems. I can imagine Coromandel not working so well in heat and humidity, as great as it is. It really is hard to restrict yourself when there is so much you want to buy. Sounds like you made a couple of great choices though. I do not mind patchouli in perfumes but I can’t say that I love patchouli as a note. I’m rather indifferent to this note, if I like a perfume or not depends on other players. MP is one of those perfumes that I’m OK with, I could even wear it if I happen to have it but it’s not interesting enough to actively seek it out or add to my collection. But I think you did it a good service with your review. Thanks Undina. I agree. I don’t feel the need to add it to my collection but for some – guys especially – I think it could be a nice way wear to patchouli in the summer months and make a change from the usually fruity colognes.